Don't see an answer to your question below? Feel free to request help or suggest additional FAQ via email: LearningCenter@apta.org or via phone: 1-800-999-2782 , extension 3206, 9:00 am - 5:00 pm ET, Monday-Friday. How do I enable pop-ups for the APTA Learning Center in my Internet browser? How do I log in to my account in the APTA Learning Center? Go to the http://learningcenter.apta.org/home.aspx page. Once there you will see a link at the top of the page on the right hand side that says "Log In". Click on that link and enter your email associated with your APTA account and your password. Once you have entered your credentials click the "Log In" button. If you do not have an account registered with APTA you can click on the "Register" button to create an account. If you already have an account with APTA please do not create a new account. Do I already have an account in the APTA Learning Center? Please contact Member Services at 800/999-2782, ext 3395, 8:30 am - 6:00 pm ET, Monday-Friday, and please be sure to have your email name ready. Where is the My Courses page? Why is the Course Status column not reflecting the correct information on the My Courses page? First, please make sure you have completed all of the activities in the course including Knowledge Checks and Assignments. If you have successfully completed all activities please refresh the My Courses page by clicking F5 on your keyboard or using the refresh button on your browser. For additional support please contact Member Services at 800/999-2782, ext 3395, 8:30 am - 6:00 pm ET, Monday-Friday. I lost my CEU Certificate, how can I obtain another copy? Click on "My Transcript" located in the top navigation bar in the Learning Center. Click on the "My Courses Transcript" link where you will be able to access CEU information for the courses you have completed and print a transcript of your CEU activity. Click "Log In" on the top right hand side of the page. Click on the "Forgot your password?" link. On that page you can enter your email address and have your password sent to your email. How can I register for multiple courses at once? Click the Purchase Now link and the online store will pop open in a new window. Click the Purchase Now link for another course. In the online store window, click the Add to Shopping Cart button. This process can be repeated until you are ready to check out. Can I get CEUs in my state for this course? Many states have different requirements for qualifying CEUs. The information for a specific course can be found on the course's long description. More information on CEUs can be found here. Hover your cursor over "My Learning Activities" on the top navigation bar. Click on the "My Courses" link located in the body of the page. Scroll down the screen until you see the course you wish to enter, click on the "Start" or "Resume" button. How do I make the course content screen larger? 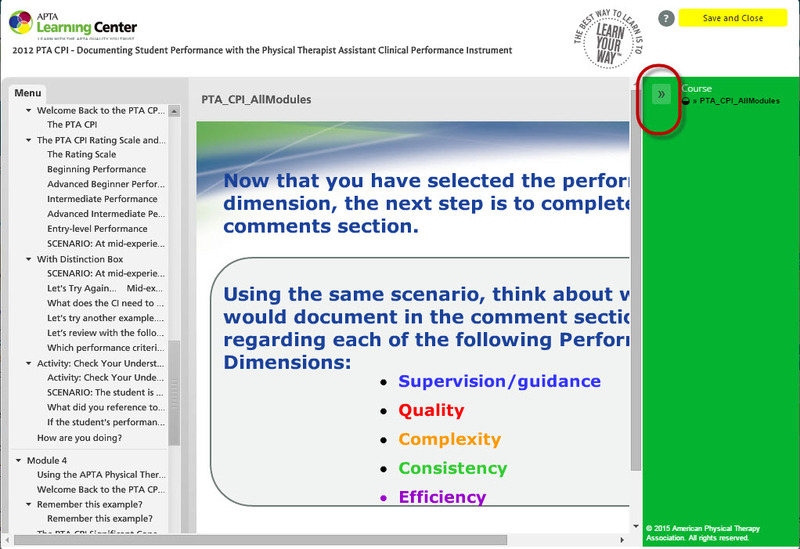 You can expand the size of the course content screen within the course window by clicking the ">>" symbol on the right hand navigation. Learning paths are a series of topic-related courses. Some learning paths result in a certificate of achievement for a specific competency. Does my personal information remain private in the Learning Center?